Want to smell like jasmine from head to toe? 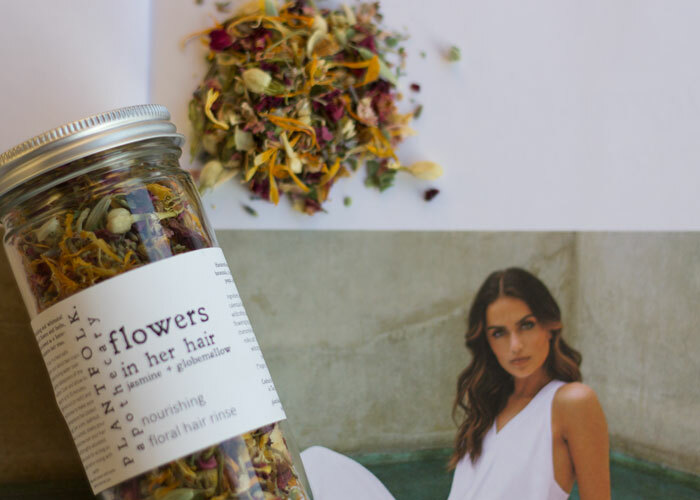 Indulge your hair and scalp with the most nourishing, whimsical blend of flowers and herbs to leave your locks shiny and smelling of jasmine, rose, calendula and lavender. That’s what I’ve been doing post-shower and in the evenings for the past few weeks, and that’s why I’m adding Plantfolk’s Flowers in Her Hair Nourishing Floral Hair Rinse as my seventh product pick during my #12DaysOfJasmine series. Though I’m not really one to fuss over my hair, I was drawn to Plantfolk’s Flowers in Her Hair Nourishing Floral Hair Rinse because of the simplicity of adding this ritual to my routine. During my morning shower, I add piping hot water and two heaps of this blend into a bowl and let it steep while I wash up. At the end of my shower, I simply dump the mixture (you can strain or not strain, depending on your preference and plumbing!) onto my head, allowing myself to take in the deeply alluring aromas of jasmine and rose. I then wrap my hair into a towel turban and get ready, allowing the mixture to really penetrate my hair and scalp, leaving it with a soft scent of mixed florals topped off with a bit of calming chamomile and juniper. The jasmine really shines through in this blend, and that’s what makes it feel so special. Organic jasmine is second on the ingredients list, and at just one whiff of the dry blend, Plantfolk’s Flowers in Her Hair Nourishing Floral Hair Rinse takes you into a bouquet of white flowers. Just imagine how intensified that scent gets when you steep the dried jasmine and herbs. Locally wildcrafted scarlet globemallow, jasmine flowers*, wild rose petals, calendula flowers*, horsetail*, chamomile flowers*, local lavender, milky oat tops*, red rose petals*, wildcrafted juniper, rosemary leaf* (*organic). When I have a little more time — usually in the evenings as I’m winding down — I’ll take it even slower with this blend, allowing a proper steep and steam, holding my face over the bowl of dainty flowers so that my facial skin can get a dose of this aromatic treat before I dip my head into it. While Plantfolk doesn’t promise miracles with this blend, it does promise the idea of magic: The magical, ceremonial feeling of pouring an infusion of flowers over your head. Your results? A feeling of calm and delight from the warm water and scent of delicious jasmine, feeding your hair and scalp the delicate floral tea that it craves after a long day, or serving up your morning calm before you start anew. 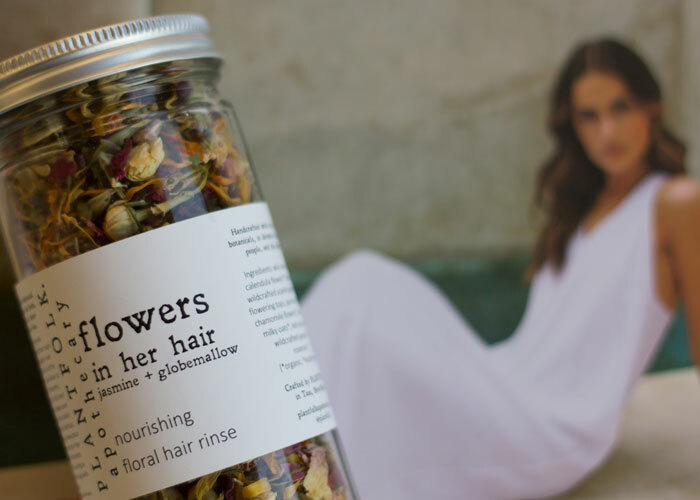 Plantfolk’s Flowers in Her Hair Nourishing Floral Hair Rinse is on my repurchase list, as it captures the essence of beauty — and the beauty of jasmine, rose, calendula and lavender — so perfectly that I can’t imagine not indulging my hair and skin in this ritual for many moons to come. How do you treat your hair? Have you ever tried a hair rinse? What products do you love from Plantfolk? Tell me in the comments section!